Don recently hosted two shows on Sunday Night Jazz on Jazz.FM91. Listen in. Don is 1/6th of Men in Suits (MIS), a Toronto-based band of business executives with one youthful and gender correct addition – Don’s daughter. See Men in Suits along with guests Amy Sky and Marc Jordan as the Lodge at Trading Bay Dance Band in August 2011. To date they’ve managed to raise hundreds of thousands of dollars for numerous charities such as CAMH (The Centre for Addiction and Mental Health), the Toronto Symphony Orchestra, Classroom Connections and several Toronto area schools. While they won’t deliver you a bill, Men in Suits only play charity events and don’t charge for their services, they will deliver a rockin good time! 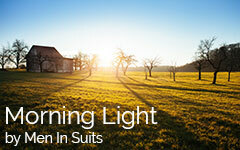 To learn more about Men In Suits and hear their latest recordings please visit www.meninsuitsmusic.com. To book the band, contact Don at don@tapscott.com. Music by Don Tapscott Sr.
Don Tapscott Sr. was a talented pianist and composer. He wrote beautiful songs, many inspired by the love of his life Mary, and played in his dance bands for 40 years. A true testament to his ability, he was asked to pen the Alma Mater for McMaster University in 1944, while still an undergraduate student. Here you will find a selection of Don Tapscott Sr.’s many classics, which demonstrate his timeless talent and knack for exquisite prose. Performances and arrangements are by Canadian jazz greats Jane Bunnett and Larry Cramer. The female vocalists are Niki Tapscott and Amy Welsman.